Prince of Wolves is sanctioned for use in Pathfinder Society Organized Play. Its Chronicle sheet and additional rules are a free download (225 KB zip/PDF). A solid first entry in the campaign setting. Prince of Wolves is the first in a line of novel-length fiction set in the world of Golarion, home of the Pathfinder role-playing game. 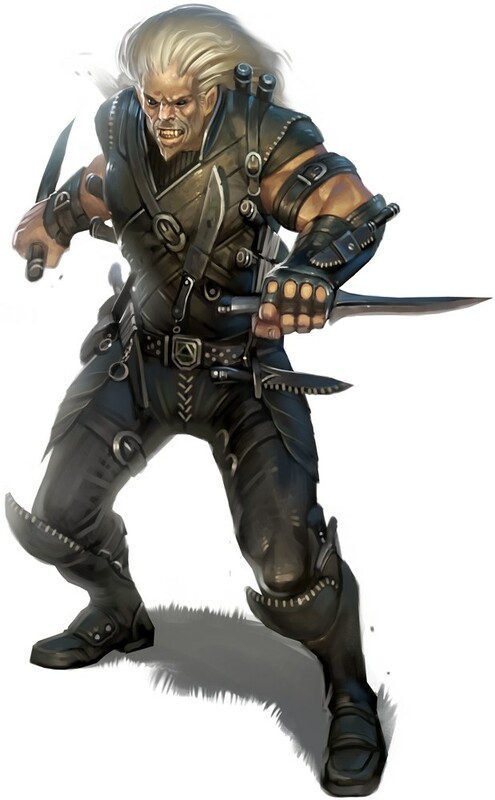 Written by Dave Gross, the book consists of alternating chapters told from two points of views: an aristocratic Pathfinder (professional explorer and knowledge-hunter) named Varian Jeggare and his bodyguard, a rough-and-tumble streetsmart Hell-touched bodyguard named Radovan. The pair are on a mission in Ustalav (a land of mists, moors, and the undead reminiscent of Ravenloft) in order to find out the fate of another missing Pathfinder. Both of the main characters are interesting, as neither fits squarely into an "adventuring class" and they have distinct but likable personalities. The plotting seems a bit rough in spots, but was solid overall. Gross wasn't shy about littering the book with references to Golarion, so fans of the campaign setting should be happy. After reading the book, I learned there were some short stories published on the Paizo website that gave a great deal of backstory to the characters--I wish the novel would have mentioned them! I really liked Prince of Wolves. I bought it in digital format and I really enjoyed the reading. I wanted to read this before the beginning of our Carrion Crown adventure (as a player) and it was really a good investment: I learned so much about Amaans and some of its inhabitants that the GM was impressed. My character will come from Kavapesta area and, as a Pharasma Inquisitor, I will have many stories to tell about the region. Moreover, I really enjoyed the story, the protagonists and their link with the history of Ustalav. I also suggest this book for non-native English readers (like me) because it was quite an easy lecture, I found it easier to read than some short Pathfinder tales which appear inside the Adventure Paths. I admit that I haven't quite finished this book at this time...but I'm already enjoying it. This is the kind of book that you think of when people say "fantasy": a half-elf and half-demon in a strange kingdom in an adventure with werewolves. Honestly, if that description doesn't at least make you curious, then you're not the kind of person who would enjoy this book. If you are at least vaguely intrigued by the concept, then I'd recommend this book. The protagonists are likable, the lore isn't too hard for people who are new to Pathfinder (thanks partly to the index at the back and the fact that Ustalav is like every classic horror movie rolled into one gothic place), and the pacing is actually pretty good. Having already read two stories and a novella, I was hooked on Radovan and Jeggare. This work started off a little slow for me, since i was used to hopping right in the action. Now that i have finished it, I wouldnt have it any other way. All of the early stuff sets up the later parts beautifully, and also gives the final mad dash an extra sense of drama. I won't go into detail to avoid spoilers, but this book has one chapter that is an all-time classic. We are used to Gross alternating points of view between Radovan and Jeggare chapter by chapter, but without warning we have a Chapter where Jeggare is writing a letter to someone that is clearly not Radovan. You may do a double-take to see if you missed something, nope - just trust Gross, and hold on for the ride! You'll be blown away! Guess that answers what Radovan chooses!!! Soo.......... where's the subscriber option? Small correction: "half-elven Pathfinder Varian Jeggare." +1, just like band aid, let my bank account have it quick. Is this the cover or is this one of the other products? I love the art, and I don't remember seeing it before. Of course with the ever expanding pathfinder products, it may just be slipping my mind. It's a mock-up, Mr Baron. We have some good news—you won't have to wait until September for the first book in our Pathfinder Fiction line to arrive! 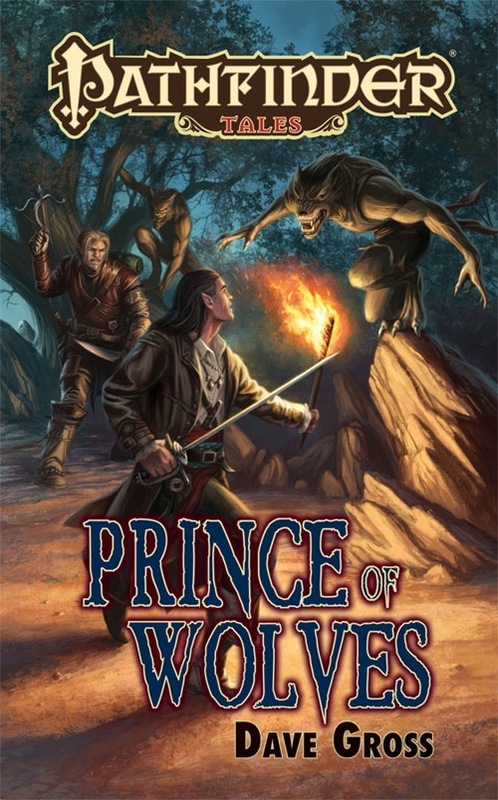 Dave Gross has turned in a fantastic manuscript for Prince of Wolves, and we've been able to adjust the release schedule so that his novel will now kick off the line at Gen Con Indy in August! Elaine Cunningham's Winter Witch will move to fill the October slot that Prince of Wolves previously occupied. We've already adjusted subscriptions so that subscribers will receive Prince of Wolves as their starting volume in August, and Winter Witch will be ship to them in October. Subscribers don't need to do anything... except count the days to August! Keep your eye on paizo.com—we'll be unveiling final cover art for both of these novels in the near future, and in just a few months, we'll be announcing more books and authors for 2011! Looking forward to these novels. So, since this is coming out early, will we get to see the cover soon? ...and Dave will be signing in our booth at Gen Con. I look forward to seeing the cover. I've updated the product description—though it's only a teeny-tiny bit different from the one that was there. Hmmm, It's got Ustalav, but someone had to go use the 'crime-solving duo' descriptor. I find myself at an impasse. I bet it will soon be revealed that it's part 1 of a trilogy that has yet to be announced. I can neither confirm nor deny that. Except for the deny part. I am often shocked to feel a presence at my elbow, and turn just in time to see Sutter right there before he disaparates. It's pretty unnerving, even after it becomes a frequent occurrence. Interesting. The guy on the cover reminds me of Gene Simmons. It's the day between Tuesday and Thursday. And it's a day that I think you're going to be looking forward to with regularity. I say there's a connection with Woden's day. It's a day that I think you're going to be looking forward to with regularity. Me in particular, or the entire Paizo community? You and much of the community. It's actually *not* off topic for this thread. So, we'll be getting previews? Author interviews? My guess... "Pathfinder Chronicles" is going to be renamed "Pathfinder Campaign Setting" so that the novels can be called the former. It would make more sense that way anyhow. Wednesday is getting pretty far along here in NYC. I hope it ends well. And still no free beer!!!!! We've updated the product image to reflect the finished product. We've also posted the first installment of our weekly serialized Pathfinder Tales Web Fiction, beginning with the first chapter of Dave Gross's four-part story, "The Lost Pathfinder." Look for new Pathfinder Tales each Wednesday! The requested URL was not found on this server, or you do not have permission to access this area. So, no tiefling on the cover? The blond guy in the back is Radovan. A great example that tieflings come in all shapes and sizes! I like this new logo. IIRC, the main tieflingy thing about Radovan were his scary messed up teeth. Some tieflings just have less obvious, more easily hidden quirks than others. It does have that kind of feel, like a TSR-era novel from the late 80's/early 90's. I'd love to see that the range of art styles that includes this and the more stylized cover for Winter Witch continue, really. One single style would just be a killjoy.